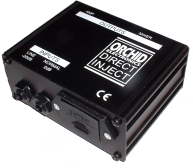 The DI (Direct Input or Direct Injection) Box is one of the less visible but nevertheless valuable parts of a PA system. Usually, it is a small box with one or more inputs (usually 1/4″ jack sockets, although some also have phono and/or XLR input sockets) and one or more outputs (always one balanced XLR socket, sometimes one or more jack sockets as well). A DI box converts an unbalanced, high impedance signal (the kind of signal generated by most pickups and contact mics) into a balanced, low impedance signal (the kind of signal required by most desks). It also isolates the output signal from the input signal (and most also incorporate an earth lift facility), so it can be used - as a temporary measure in an emergency - to cure ground loop problems in other parts of the signal chain (e.g. between desk and power amplifier). DI boxes come in two main flavours: Active and Passive. Active DI Boxes use electronic circuits to convert and isolate the output signal from the input signal. For this reason, they always require power. Most active DI boxes can use batteries - usually 9V PP3 - or phantom power (and our own can use either source). However, some DI boxes cannot run on phantom power (i.e. they need batteries), and some cannot use batteries (i.e. they won't work unless the desk can supply phantom power). A few varieties will run from separate power‑supply units. Passive DI Boxes use transformers to convert and isolate the output signal from the input signal. They are usually cheaper than active DI boxes, and do not require any power. However, the reactance of a transformer increases as frequency rises, so most passive DI boxes will exhibit some high-frequency signal loss. In all but the cheapest passive DI boxes this will not greatly affect the signal within its useful range, and the degree of difference is comparable with the difference between dynamic and condenser microphones. It doesn't seem to be working (in which case check on/off and mute switches if it has them, as well as the connections and the phantom power or battery). Connecting the instrument directly to the desk's input creates a ground loop (characterised by a hum or buzz at 50 Hz and/or whole multiples of that frequency). This situation can arise where on-stage effects-units or amplifiers form part of the signal path, and have earthed power supplies. It is good practice to install new batteries in all battery-driven devices before the start of any show (so you can be confident they won't die during the encore). This involves the bother and expense of changing batteries frequently, as well as remembering to change them. A passive DI box does not need batteries. If phantom power is not usually available, a high-quality passive DI box will probably be your best option. A light to indicate that it is switched on and receiving power. This also acts as an instant line-check: if you turn on the channel phantom power and the DI box light comes on, you know you have a good connection to the right channel.